Dehradun, June 21: International Yoga Day is an inspirational moment for Yoga lovers and also for those who are wishing to get into this world of rejuvenation and relaxation. Today is the time to spread the message of Yoga all over the world. This ancient way of keeping the body fit and free from all kinds of diseases is nothing but a boon of Indian Culture and ancient Indian Science too. Today the world is celebrating the 4th International Yoga Day. To demonstrate the power of Yoga, Prime Minister Narendra Modi with thousands of people performed various Yoga Asanas, in the main event organized at Forest Research Institute in Dehradun, Uttarakhand. He called upon the people to make Yoga a movement by saying, "The world has embraced Yoga and glimpses of this can be seen in the manner in which International Day of Yoga has been marked every year. In fact, Yoga Day has become one of the biggest mass movements in the quest for good health and well-being." PM Modi said that Yoga is beautiful because it is ancient yet modern, it is constant yet evolving. It has the best of our past and presents and a ray of hope for our future. In Yoga, we have the perfect solution to the problems we face, either as individuals or in our society. Modi said, Yoga has been a part of Indian tradition and it integrates the people. He said, Uttarakhand is the Yoga Bhumi and it has been the center of yoga for decades. He said, by doing Yoga, the person can remain fit and healthy throughout his life. Modi said yoga has shown the world the path from illness to wellness. He said instead of dividing, Yoga unites, instead of further animosity, yoga assimilates and instead of suffering, Yoga heals. Governor K.K. Paul, Union, and MoS for AYUSH Shripad Yesso Naik and Chief Minister Trivendra Singh Rawat were also present on this occasion. Chief Minister welcomed the Prime Minister Narendra Modi and thanked him for selecting the state capital as the host of the main event of International Yoga Day. 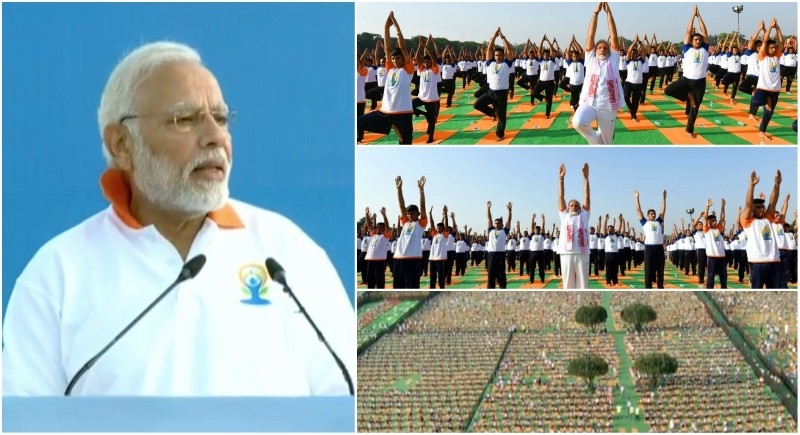 More than 50 thousand participants performed yoga with Prime Minister at FRI Lawns and sent the message, healthy living through Yoga across the country. Speaking on the occasion the Prime Minister said that, India has given a message of Yoga at the global level. He said, yoga is bringing peace and harmony to the world and it has linked the whole world. Modi Congratulate the State Government for successfully organizing the event. Yoga is a physical, mental and spiritual practice originated in ancient India. In 2015, United Nations General Assembly unanimously announced 21st June as the International day for yoga to raise awareness about the benefits of practicing yoga. Prime Minister Narendra Modi in his UN address in 2014 proposed the idea of International Yoga day.